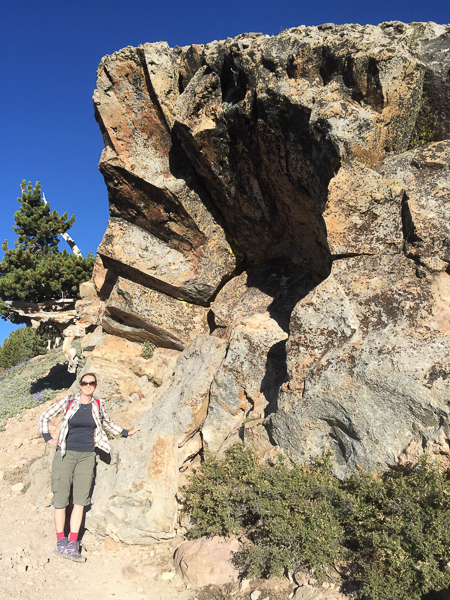 Bear, Bison & Beauty: Exploring Lassen Volcanic & Yellowstone National Parks — 2checkingout | travel and adventure | Inspiring. Capturing. Experiencing. Let’s skip back in time briefly. Upon arriving in the land of the free, wall to wall advertising, and stunning national parks, we spent a couple of days in San Francisco replacing clothes that had worn out or were too big. This travel malarkey is a great way to lose weight. Best guess is that I have lost 14 kilograms (30 pounds) since we left New Zealand. Not having access to my daily coffee and muffin, and all the extra walking has me in slightly better shape than when we left. After our first proper shop in months we spent a couple of days with friends, Paul & Rick, at their cute cottage in Bodega Bay. We met Paul last year at the Elephant Nature Park in Thailand. The neat thing about hanging out with these guys (there are quite a few) is that they had visited many of the national parks. The plan was to visit nine parks across five states. When we shared our route, they had some great feedback. These guys had done most of the day hikes so helped us pick the best ones. Home for the next 48 days was a 23 foot RV. 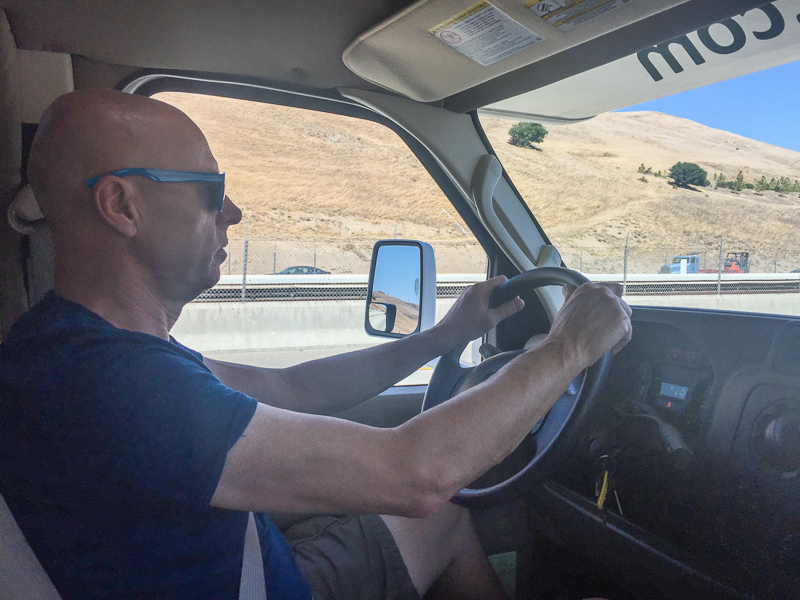 Not having driven anything so big, and not used to driving on the wrong side of the road we couldn’t wait to get away from the freeways and cities. This thing drifted at the best of times but with a slight breeze it had the stability of wet cardboard box. For the next 4,000 miles, we were going to have to concentrate on every inch of tarmac. Our last home on wheels, our beloved 1975 Volkswagen Type II aka The TARDIS, was akin to living in a bedsit compared to this mini mansion. 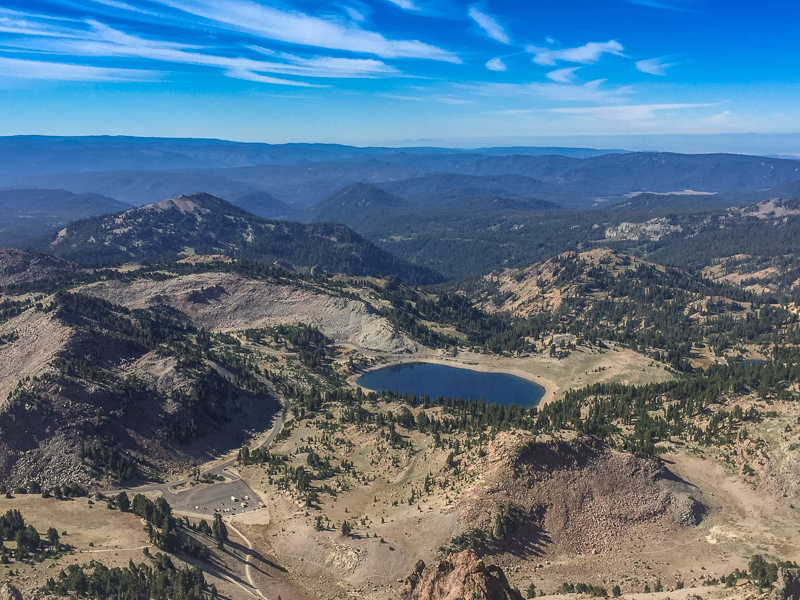 One park we didn’t have on our list was Lassen Volcanic National Park, in Northern California. The boys insisted that we should add it to the list so off we went. We had a week before we headed into the desert for Burning Man, so plenty of time to explore. 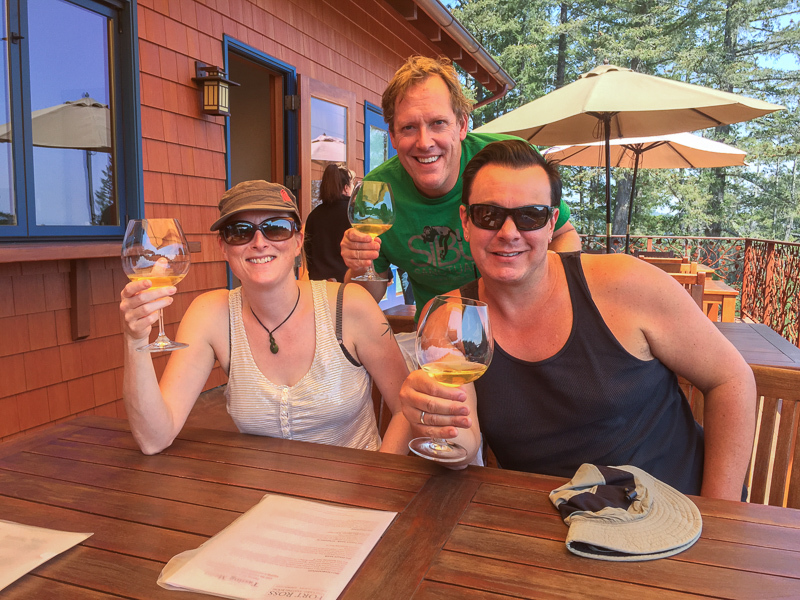 We stopped for a couple of nights just outside Sacramento, to stock up on food, find a bike for Julie and unwind after a couple of days in the big smoke. Paul had already donated a bike for me, Julie’s came via Craig’s List. 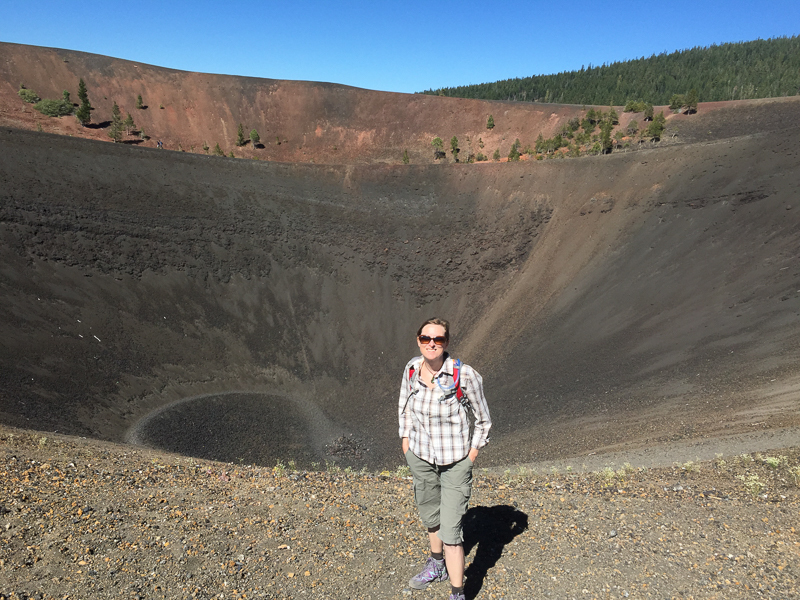 Lassen was a fantastic way to start our national park adventures. The park itself was pretty quiet but also fairly compact so easy to get around and find the hikes that interested us. The campgrounds were reasonably empty. The bargain of bargains in the USA must be the annual pass to all 58 national parks. At just $80 per car, to quote a great movie ‘it’s a deal, it’s a steal, in fact, it’s the sale of the f***ing century’. After checking out the visitors centre and armed with maps and the park newsletter we set off putting our best walking boots forward. It actually felt like it had been a while since we had done a strenuous hike. There is some debate over how many types of volcanoes there are, three or four. 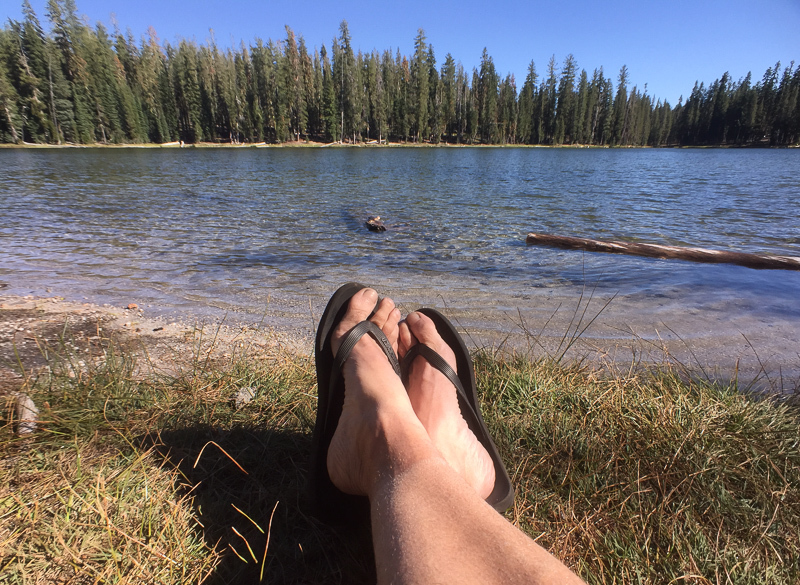 Regardless of who is right Lassen has four, and we were going to hike up two of them. 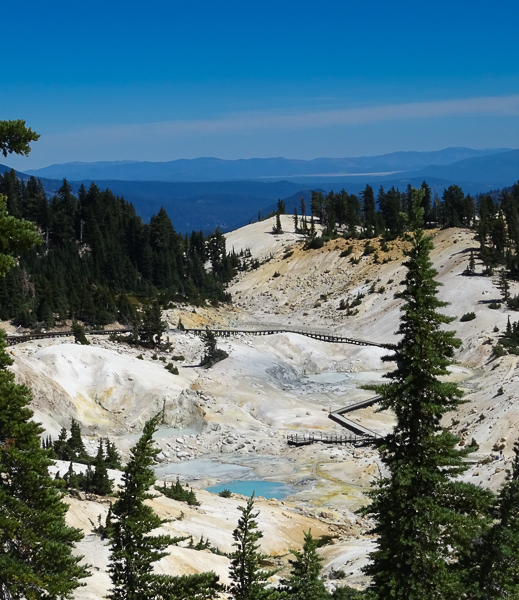 But, our first stop was Bumpass Hell. Named after Kendall Vanhook Bumpass (what a name!) who whilst guiding a reporter through the area in 1865 fell into one of the geo thermal pools. He was so badly burnt that one leg had to be amputated. The price of fame. 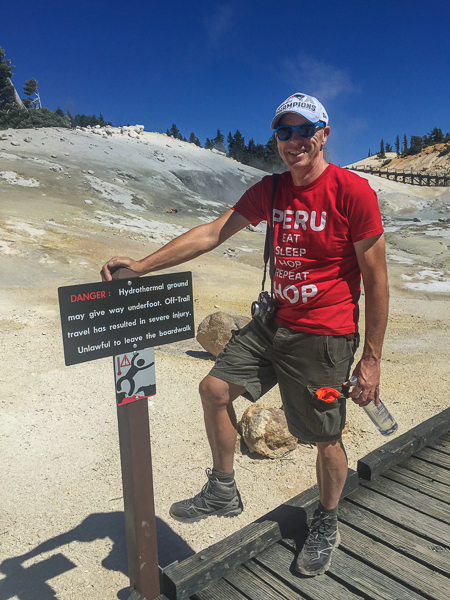 Coming from New Zealand, the land of thermal wonders, you get a little blasé about bubbling mud pools but this little walk was impressive. 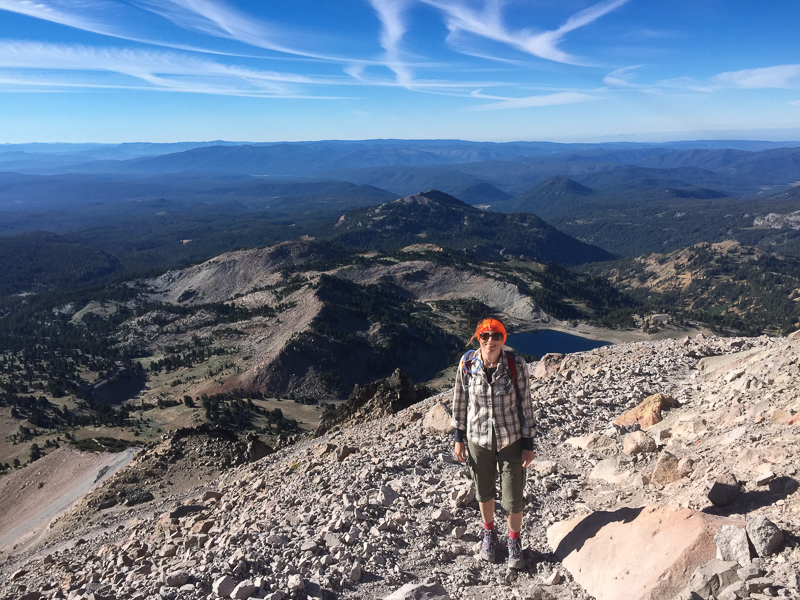 The following day we hiked to the top of Lassen Peak which is a plug dome volcano. Up bright and early to beat the rush, this 9 kilometre hike sees you gain a total of 596 metres. One side was so windy you were lucky not to be blown off, yet the other side it was baking hot with no wind at all. The views from the top are spectacular. It’s quite gratifying to heading back down when most people are just starting out. You also find a more civilized bunch of folk first thing, we started to call them the ‘EMC’ - Early Morning Club. We found a quiet spot at King’s Meadow for a lunch and even dipped our toes into the babbling brook that ran through it. There wasn’t much on the wildlife front except for a mother deer and her fawn. 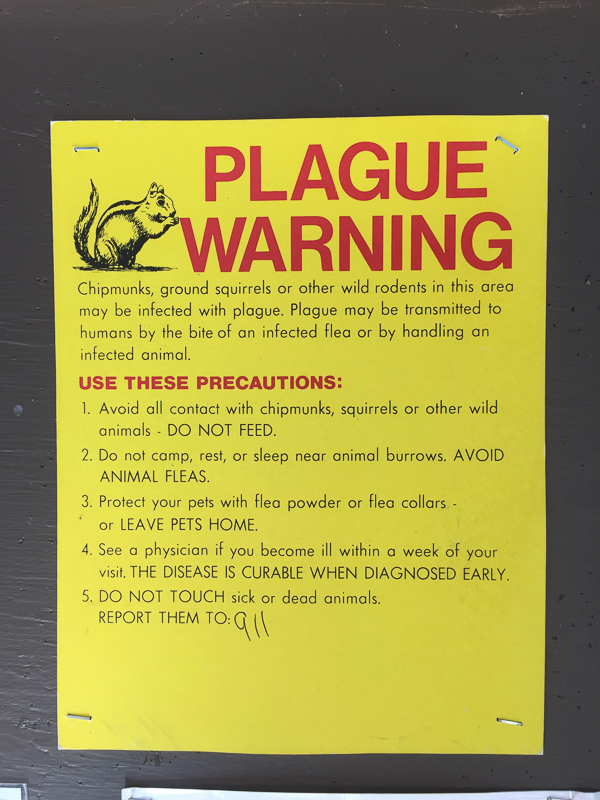 Mind you the plague carrying chipmunks made up for that in sheer numbers. Chip and Dale never seemed so threatening. Our next hike required us to leave the park and reenter 40 miles down the road at Butte Lake. This also meant taking the RV down a dirt track for the first time and not everything was as secure as it should have been. 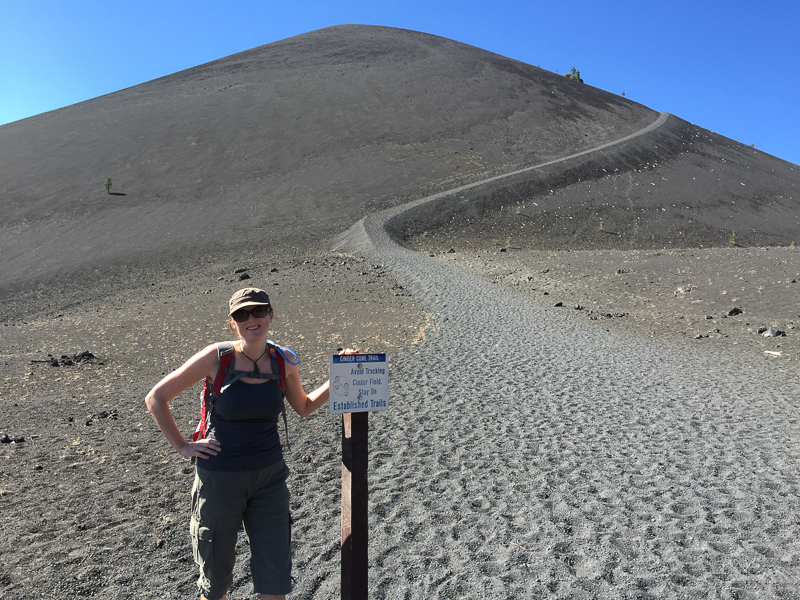 Cinder Cone is, yep you guessed it, another type of volcano and an amazing little hike. From the carpark the path its cinder chips all the way to the very top of this 6.5 kilometre walk that gains 250 metres. The steep path that winds its way around the side of the volcano is even harder coming down. It’s almost two steps forward one step back. Again we were thankful not to be doing this walk in the heat of the midday sun. The views from the top across the park were amazing, lava flows to one side, painted dunes to the other. The campground at Butte Lake was incrediably quiet, we were the only one staying. At dusk another couple rocked up and said ‘hi’. It turned out they were experienced Burners and on their way to Black Rock City too. We shared a wine or two round the fire pit picking their brains. The whole fire pit thing took some getting used to especially when California is on extreme fire alert. The next stop was Burning Man. 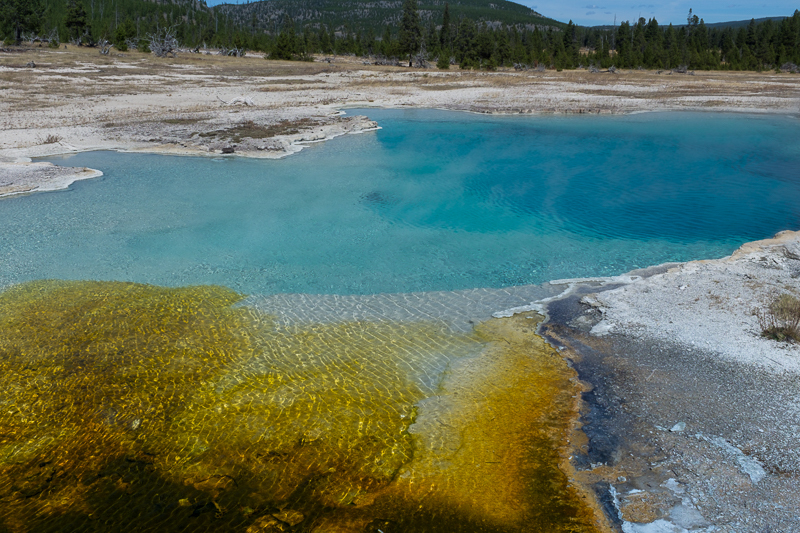 After that we head to park number two, Yellowstone. The journey from Burning Man to Yellowstone is over 700 miles and took three days. Two of those were spent at Winnemucca decompressing and cleaning up eight crazy days worth of dust. We pulled into one rest stop by the side of a creek to find a sign warning about ‘New Zealand snails’. Now, I know we were driving a little slow but there was no need to be so rude. 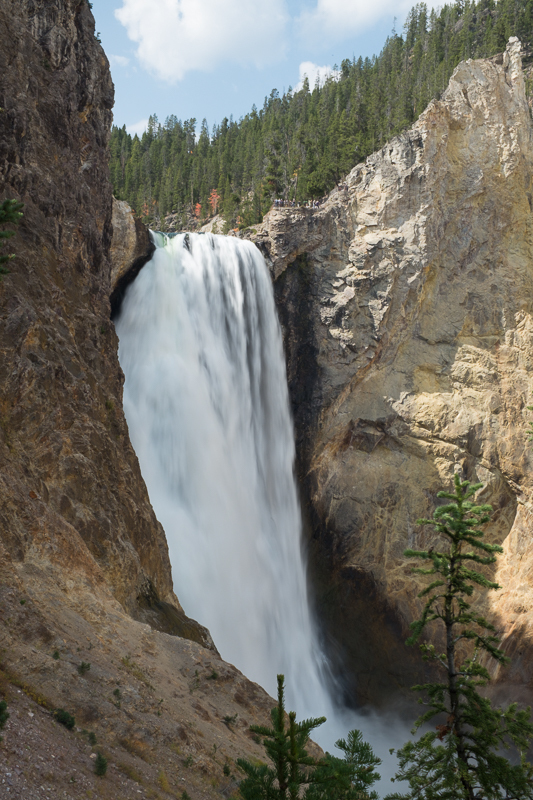 Yellowstone, maybe the most famous of the national parks; Yogi Bear and Old Faithful two of its superstars. 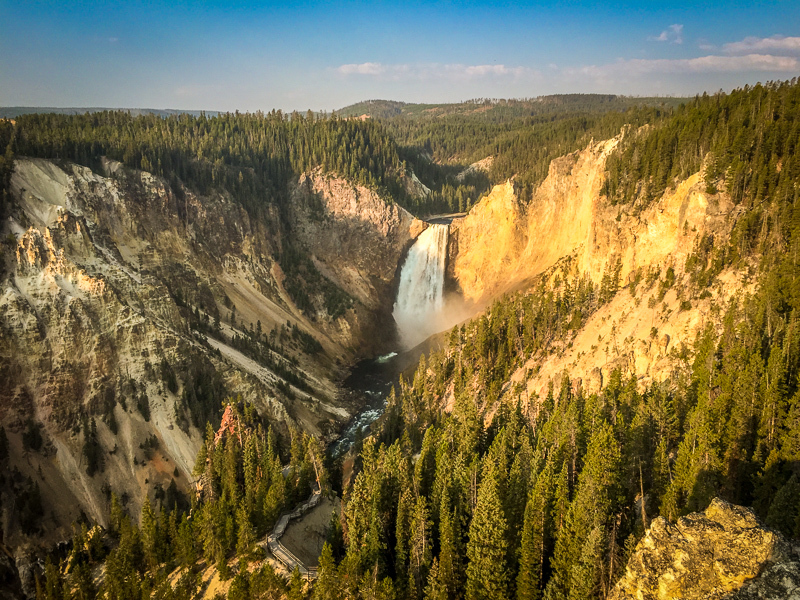 Established in 1872, Yellowstone was the world’s first national park. At nearly 3,500 square miles, it’s the eighth largest in the USA and number four for the most visitors. So leaving booking your campsite until you are driving through the gate is probably not the most sensible idea. 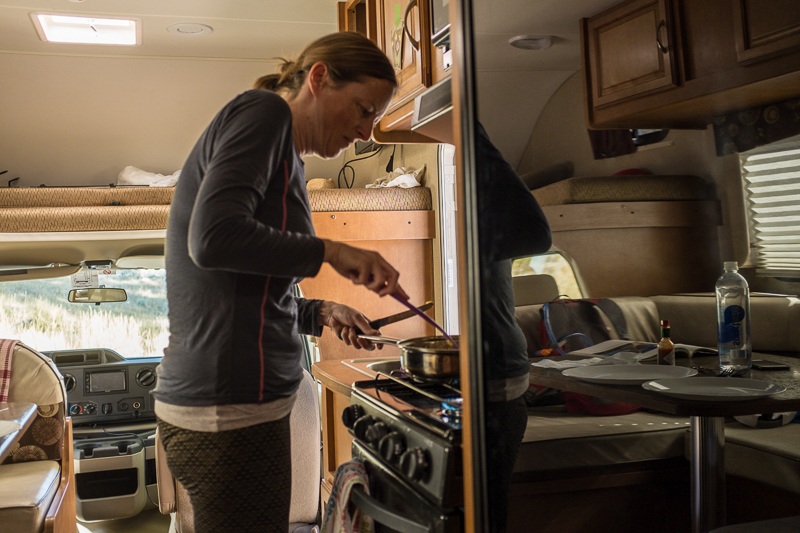 Julie was frantically dialing the campgrounds looking for a space as we drove in. Thankfully we managed to grab a couple of nights at Grant Village in the south of the park. Within a couple of miles of entering we came across bison grazing by the side of the road. 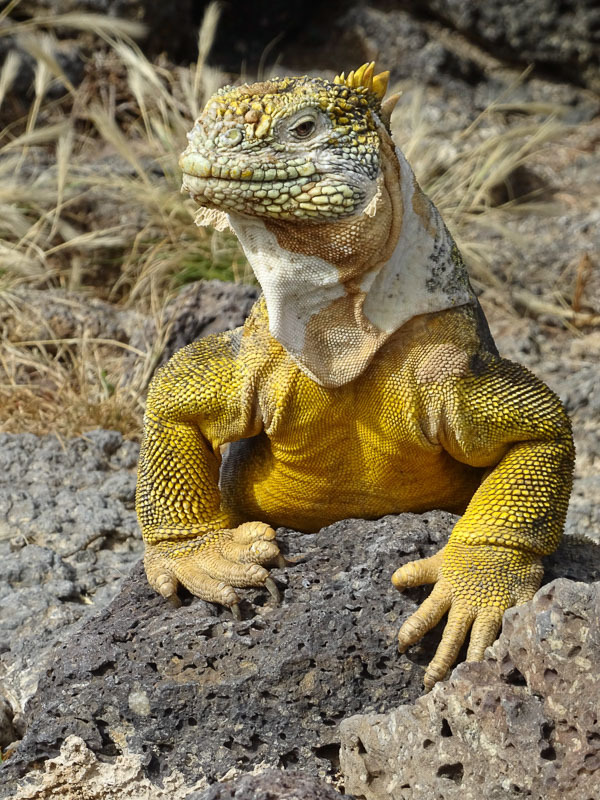 These magnificent animals have been successfully reintroduced into a number of the parks. At the visitors centre we checked on a couple of day hikes as well as campsite availability. This centre had a huge picture window and sitting outside was a huge bison. Picture perfect. Yellowstone has the largest geo thermal activity in the world with hundreds of geysers and the star of the show, Old Faithful. Unlike Lady Knox Geyser at Wai-O-Tapu (Rotorua, NZ) Old Faithful does not need washing powder to kickstart an eruption. On our visit the eruption happened five minutes after the predicated time, which Julie guessed right. Not quite reaching it maximum potential of 186 feet, today’s eruption was still spectacular at somewhere below 100 feet. The Grant Village campsite was rather busy, all its 400 hundred sites full of RV’s of every shape and size. 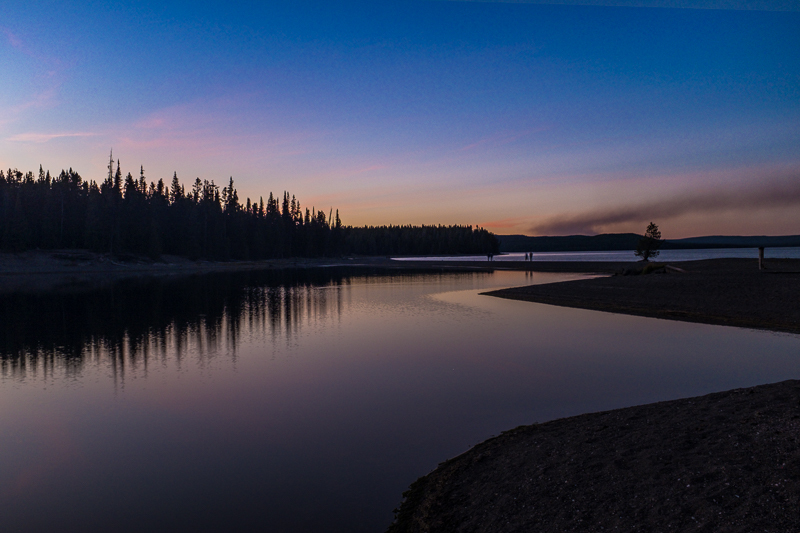 Situated by the edge of Yellowstone Lake, we had an easy stroll at sunset which was beautiful. 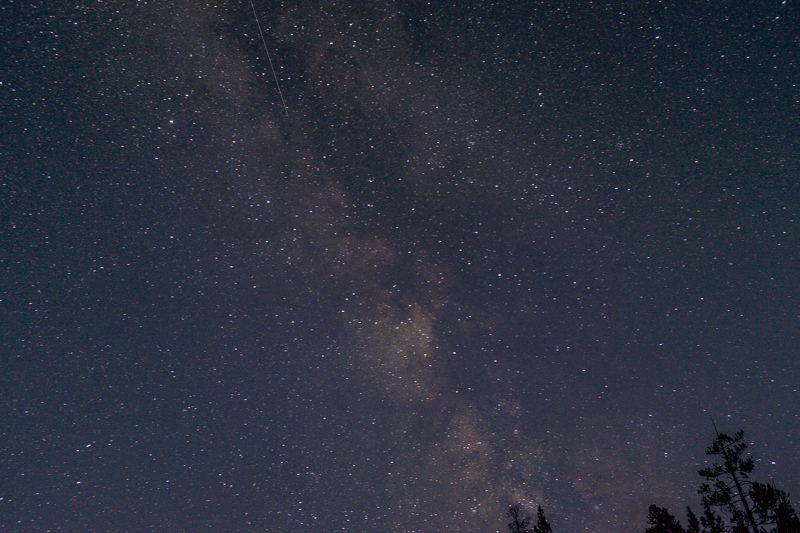 I also tried to capture some of the zillions of stars and part of the Milky Way. Well I have been lugging a tripod around and had to put to use or somebody would have suggested it was surplus to requirements. We were up bright and early the following day to try to secure a site at Tower Junction campground. A first come first served site and 50 miles away. Driving around the edge of the lake as the sun rose was stunning, amazing colours in all directions, shafts of orange light peeking through the trees. 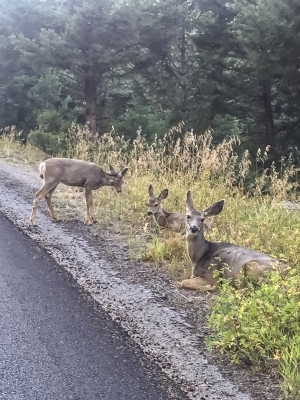 The only wildlife we saw were mule deer, very cute with extra large ears. We arrived just in time to snag a site, 30 minutes later the campground was full. One of the recommended walks is Mount Washburn so off we went. On the noticeboard at the trailhead was some bear safety information. Somebody had handwritten on the notice that they and another group of walkers had been charged by a large male grizzly just a few days ago. Hmmmm. Being cheapskates we had decided against buying/renting bear spray, so Julie armed herself with SPF50 sun protection spray and off we headed. About quarter of mile along, the trail cut through a small thicket of trees. It was here that the aforementioned grizzly was sighted. We picked up the pace and started talking in loud deep voices; we drew the line at singing. This 10 kilometre round strip starts at 3,107 metres and climbs an additional 425 metres. 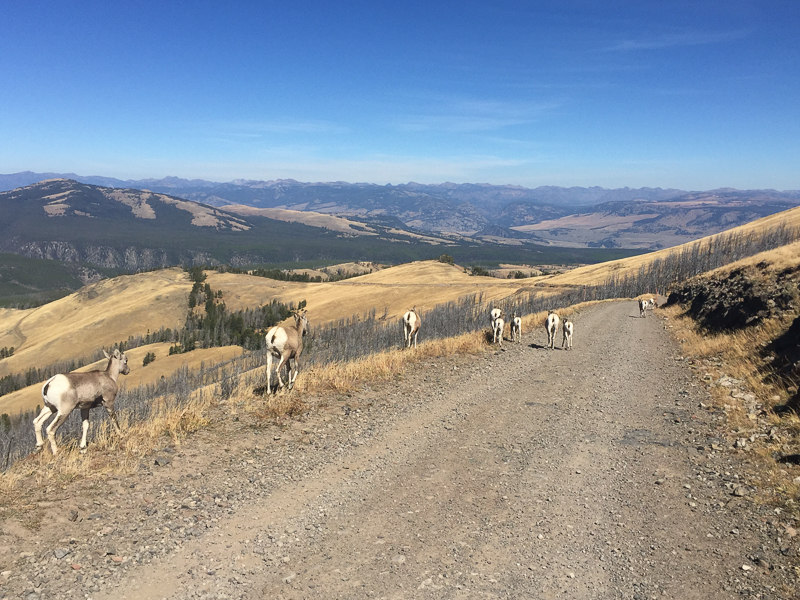 On the way up we came across a flock of grumpy looking bighorn sheep. Even the lambs had that ‘don’t mess with me’ look. 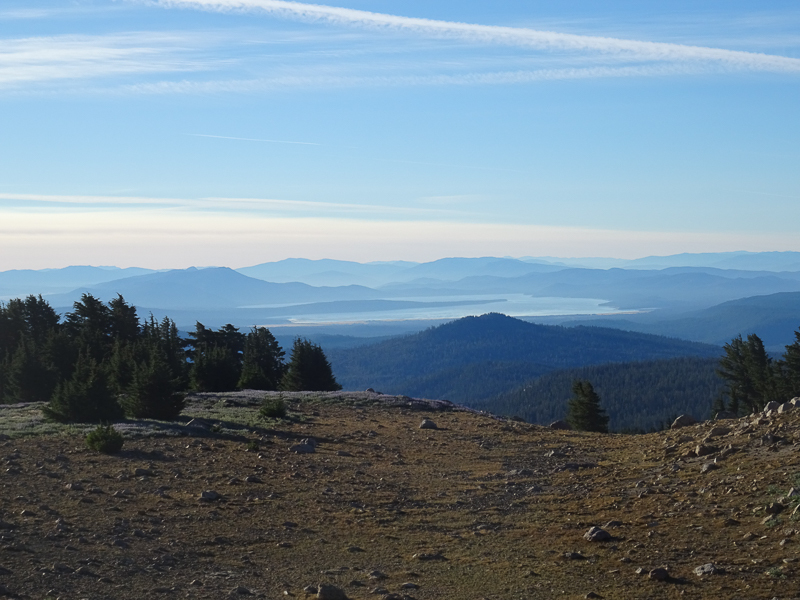 It’s the highest peak in the park accessible by Joe Public and great swaths of Yellowstone are visible. On the horizon the mountain range at Grand Teton, an adjoining park. There is a fire lookout station that is still manned by a Ranger who spends summer in splendid isolation. Well once the day walkers have headed off for their lattes. It must be so peaceful to watch sunrise and sunset from here. We made it back to the car without any bear encounters, somewhat relieved and disappointed at the same time. Julie’s research suggested that the Lamar Valley would be a good place to spot wildlife so another early start was called for. We found a parking area overlooking the valley and switched to wildlife spotting mode. Now of course, we were properly equipped to spot wildlife, not. We listened with envy as a group next to us with a powerful telescope went on about a bear they could see foraging on the edge of the distant woods. All we could see was a herd of bison grazing and they were just dots on the landscape. Disgruntled we moved on further up the valley, stunning scenery but alas no wildlife. Heading back we came across a dozen cars parked up. Slamming on the brakes and taking the RV off road we jumped out and there in front of us was our first grizzly bear, not more than 50 metres away. We managed to grab a couple of photos before it trudged off into the distance. Ha, who needs a fancy telescopes, the early morning start paid off. Back at camp, we had an even closer wildlife experience. 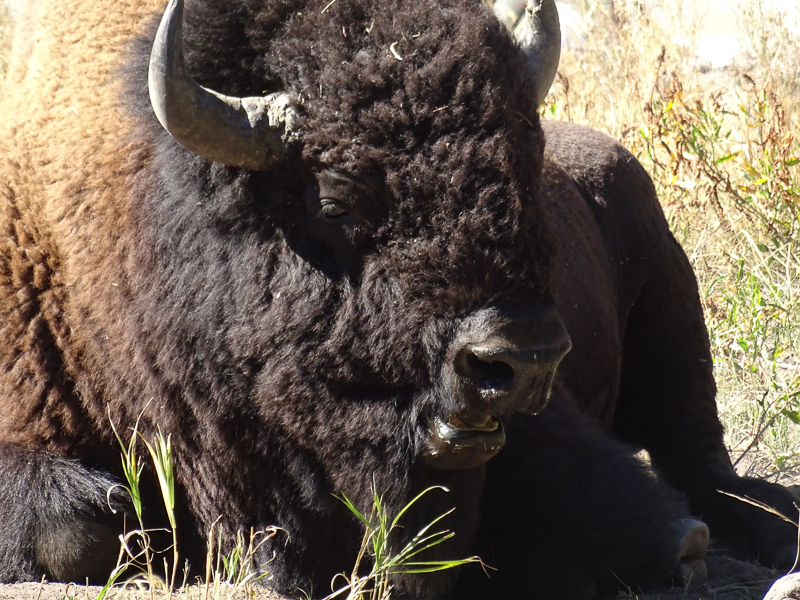 A huge male bison was wandering through the site, eventually settling down feet from our RV. It spent most of the afternoon crashed out in sun occasionally rolling over to get an all over tan. We named our new pet ‘Benedict’. Late afternoon Benedict disappeared into the woods and despite our frantic searching he never came home, insert sad face. The following day we upped sticks and mooched south, staying at Grant Village again. 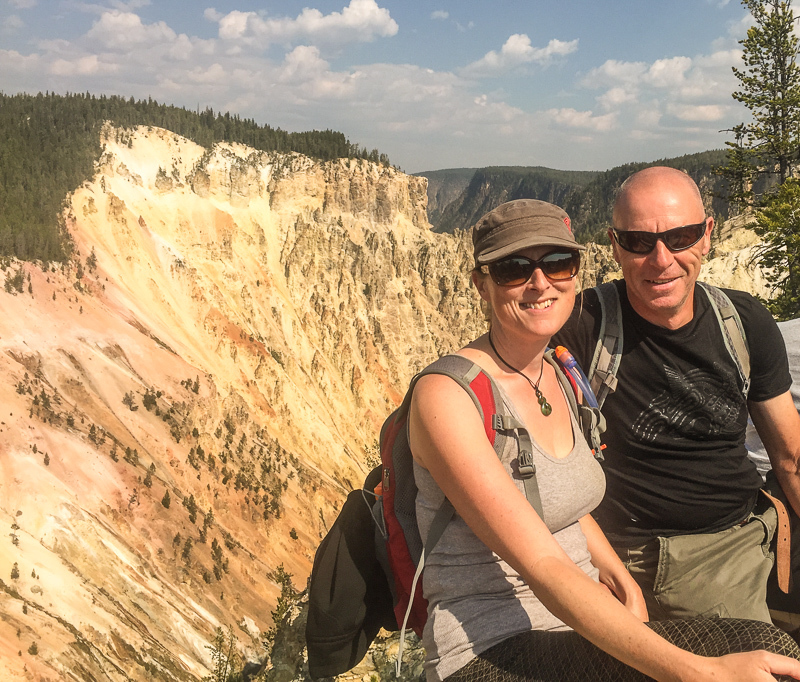 Along the way, we walked along the ridge of the Grand Canyon of Yellowstone. On one side, we visited Inspiration Point which was anything but inspiring. Unfortunately, an earthquake had made part of the canyon unstable and the viewing platform was closed. On the south of the canyon, we took Uncle Tom’s trail down 328 steps to the base of the Lower Falls. Going down the metal staircase was easy, coming back up the near 500 foot climb was a different story. Then we walked along the ridge to Artist Point, which offered a stunning view of the canyon and the multitude of colours that make up the canyon walls. So there you have it, our first couple of national parks under our belt. A 1,000 miles into our 4,000 mile trip. We highly recommend both parks, they are so different. 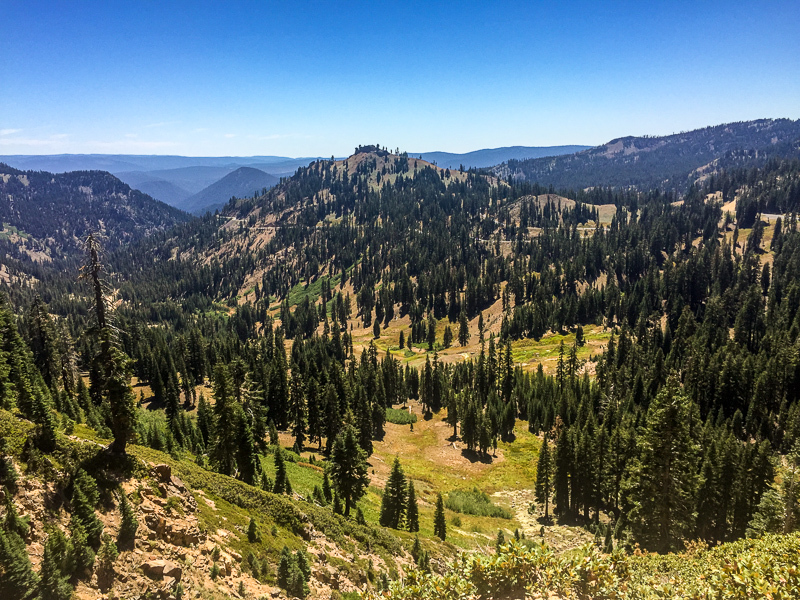 Lassen was small, quiet and offered some challenging hikes. 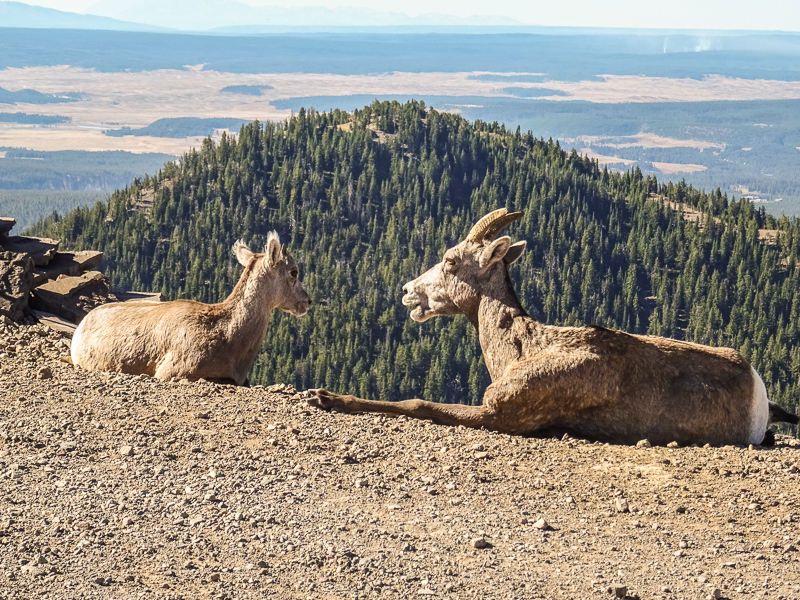 Yellowstone was clearly busier but offered great wildlife opportunities. 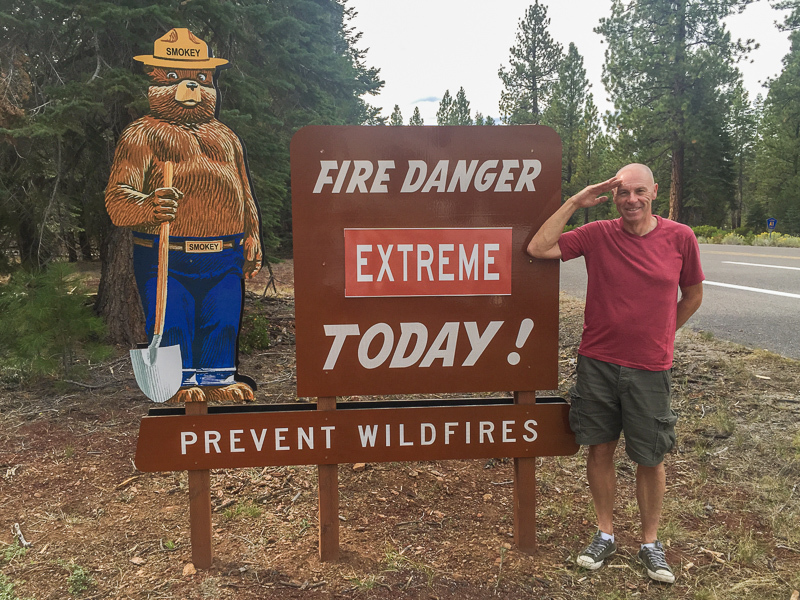 We could have quite easily spent another few days in Yellowstone, there is so much to see and do.